HomeUncategorizedIs Your Baggage a Pain in Your Neck and Back? Every day of your life you are probably using some sort of “baggage,” whether you are traveling for business, going shopping, going out to eat and to the movies, or lugging books back and forth to school. 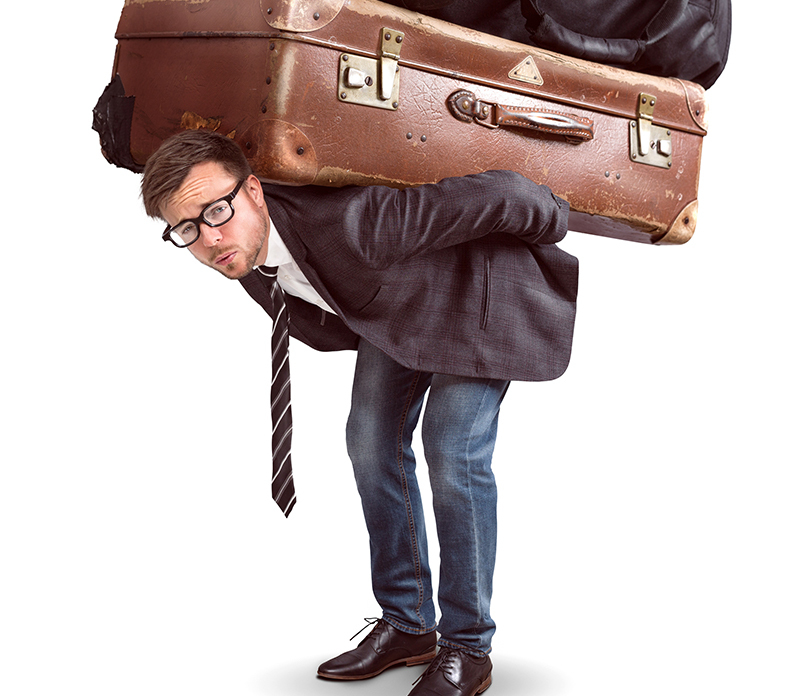 People from all walks of life use suitcases, purses, shoulder bags, and backpacks to transport their belongings, putting wear and tear on their shoulders, backs, and necks. Since you cannot get away from carrying items from point A to point B, making sure you pick the right type of bag for the job can help minimize back strain and the resulting neck and lower back injuries. Purses – Women carry purses not just to accessorize, which they love to do, but because the purse holds important toiletries: wallet, lipstick, cellphone, keys, etc. Today’s style has purses being oversized, and women tend to fill up the extra space, adding extra strain on the shoulders and causing neck and shoulder pain. When trying to decide on a purse, the American Occupational Therapy Association, Inc. recommends breaking it out into three categories: material, bag size, and straps. Material: Although leather is hardy and beautiful to look at, it is also heavy. Consider choosing a lighter material like microfiber or fabric, especially for a purse you will use on long trips. Bag size: When running short errands, choose a compact purse that is easy to carry. Pack only those items you need for the trip in the purse, leaving the extras in the car or at home. This lightens your load. If you’re headed out to dinner, choose a simple clutch. For the longer trips, like a day of shopping, consider a backpack purse that evenly distributes the weight on your shoulders. Pack it carefully, avoiding too much weight. Straps: Avoid purses with thin straps as they won’t distribute the weight well. Wider straps are better. For long straps, carry the purse with the strap slung across the opposite shoulder, and be sure to switch sides often. If the purse has handles or short straps, change the position of the strap often, avoiding muscle fatigue. Backpacks – Everyone from children to adults carries backpacks. They make convenient carry-ons when flying and are ideal for student textbooks and homework. The big drawback to backpacks is that they can be filled with too much weight for the carrier. NBC News states that a backpack should not weigh more than 10 to 15 percent of the individual’s body weight. Going over that puts too much strain on the body’s shoulders and back, creating problems. Chose a lightweight material for the backpack itself so you don’t take up too much of your weight limit. Make sure that you adjust where your backpack hangs. It should sit close to your lower back, which is your center of gravity. Adjust the straps so that the backpack sits close against your body. SHAPE recommends padded, wide straps to spread the weight of the bag out over more surface space. Suitcases – When traveling requires something larger than a purse or backpack, the suitcase comes out of the closet. Rolling suitcases are an amazing invention and definitely an improvement over awkwardly carrying a heavy suitcase in one hand; but Mike McMorris, an assistant professor of physical therapy at UNC-Chapel Hill, says that rolling a suitcase on just two wheels has its drawbacks. Pulling a suitcase at a tilt creates a pull on the arm and back. The best choice when traveling is a suitcase on four wheels that rotate 360 degrees. Make sure the handle is at your waist for the ideal height. Having an inverted U for the handle shape is more ergonomically friendly than the inverted T. One last item to keep in mind is to pick a handle that fits your hand. Spending a little extra money on the proper suitcase may keep you from spending money visiting the doctor for neck and back pain. No one wants to stop traveling and carrying personal belongings with while shopping. Being wise in picking what types bags you use may save you some pain and suffering in the future. If you find yourself already experiencing distracting neck or back pain, contact the specialists at Atlanta Brain and Spine Care, and let them get you up and running pain-free once again.